On Wednesday's post I took you on a tour of nearby Jekyll Island, where I spent the day at Driftwood Beach. I packed a picnic lunch and today I wanted to share recipes for the two quick salads I prepared for my outing. My meal started with one of my favorite sandwiches. I layer Boar's Head Blazin' Buffalo Roasted Chicken with their Jalapeno Jack Cheese, avocado slices, alfalfa sprouts and fat-free mayonnaise. Mmmmm… yummy! I like things with a kick and this has enough heat to be pleasant, not overwhelmingly hot. Since I wasn't sure how long I would be on the island, I packed two salads. The first is one of my favorites, Island Slaw. The flavor is so summery and the dressing, oh so, tropical! 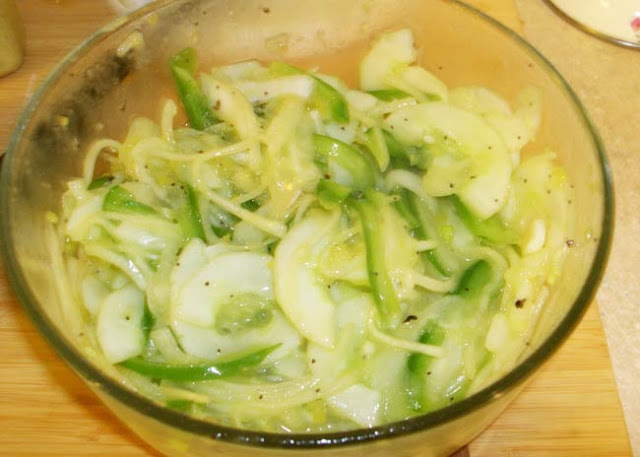 Slice one cucumber, one green bell pepper and one sweet onion into thin (very thin) slices. Make sure your veggies are nice and fresh, the crispness mixed with the dressing just makes your tastebuds do the happy dance. 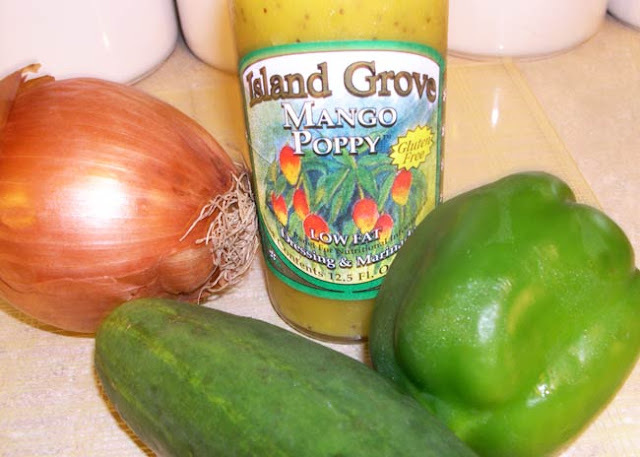 Add enough Island Grove Mango Poppy dressing to have a "wet" mixture, I used about one third of the bottle. 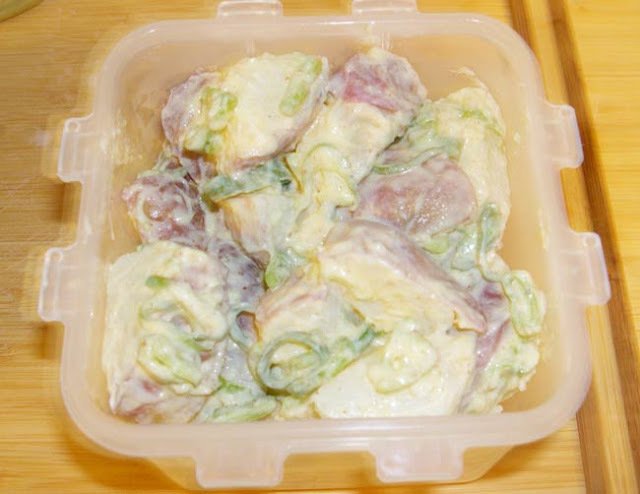 Place mixture into a container with a lid or a large ziplock bag. Refrigerate overnight, turning or shaking occasionally. The flavors will meld together and the bell pepper and onion will become a little limp, this is what your looking for. While I was putting the Island Slaw together, I had put a couple of large red potatoes, cut into chunks, on to boil. Boil them just until they become tender (check for doneness with a fork, do not overcook. 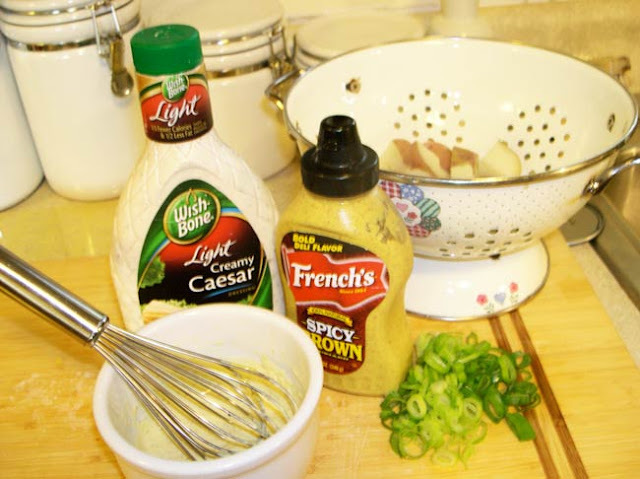 Whisk together Wishbone's Light Creamy Caesar Dressing with French's Spicy Brown Mustard to your taste preference. Toss with potatoes and chopped chives or the tops of green onion. Now, weren't those easy? 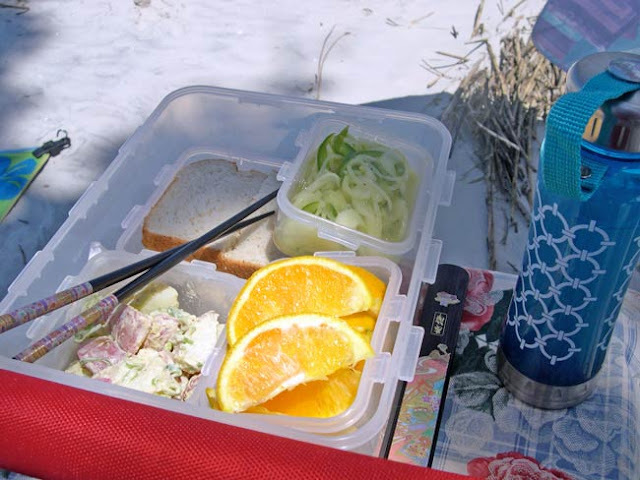 Be sure to make both salads and the sandwich the day before, one of the essentials when packing a picnic is that your meal is nice and cold when you start out. I packed everything into what I call my Beach Bento Box. 'O-bento' is what the Japanese call a packed meal, usually lunch. Bento boxes have internal dividers or containers, and sometimes several stacked layers, so different kinds of food sit in their own little compartments. 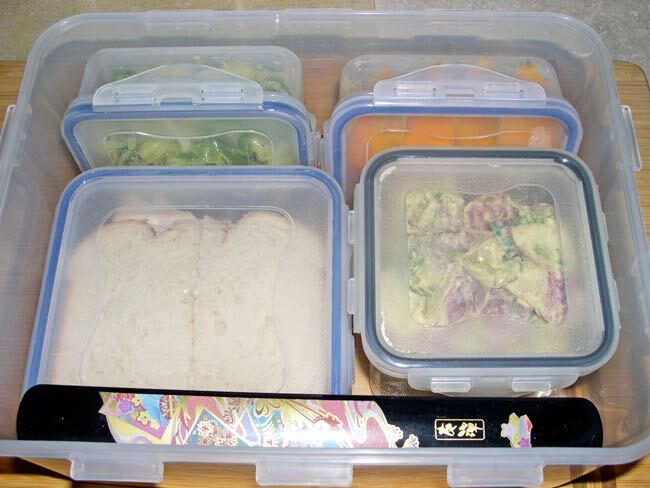 Bento boxes range from beautiful lacquered wood boxes children's plastic lunchboxes. In my box, they are Lock & Lock containers. The large one I use is the 5.5L/185 oz/5.8 Qt. size. If you haven't used these containers before, I highly recommend them. They are the only ones I've found that are truly watertight. I've packed them in my camping coolers with ice and when the ice melts, not one drop of water gets inside. I also use their storage containers in my cupboards for everything and I mean everything! My cupboards look like something out of that movie Sleeping with the Enemy with Julia Roberts. Everything stays fresh and no bugs! You can find them online and at stores like Bed, Bath and Beyond. 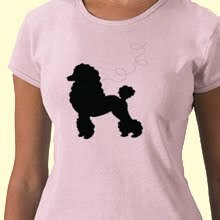 Accept no substitutions, I once bought another brand that looked like them and needless to say, they ended up in my next garage sale. Okay, back to my bento box picnic. Normally I would have toted some mango slices along for this lunch, but on my daughter's recent visit she brought me a bag of Indian River Oranges. These are the BEST oranges, grown in Florida, they are naturally sweet and juicy and make the most wonderful orange juice. I sliced one up and added it to my meal. I have about eight different coolers, but my favorite one for a picnic is by California Innovations. It rolls and when your toting a beach chair, an umbrella and a beach bag, it's nice to have something you can pull along. My bento box fits perfectly in the bottom! I can fit all three of my beverage bottles beside it (one for pink lemonade, one for water and one for sweet tea) and then top the box with two or three frozen 1 liter water bottles to get everything nice and cold. I used two on this day and when I arrived home 10 hours later, the bottles were still half frozen. As the weather gets hotter, I'll add one more frozen bottle to the mix. 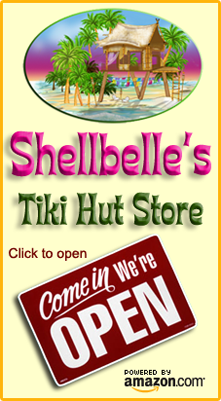 California Innovations coolers are sold in many retail stores, but if you have a problem finding one, I added it to Shellbelle's Tiki Hut Store. You can find it here. 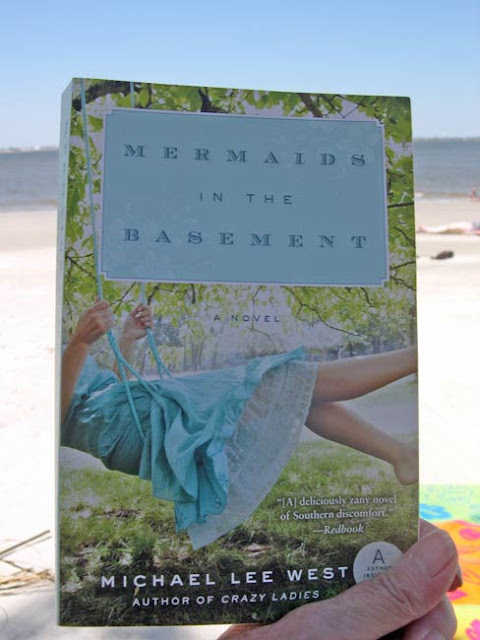 Yep, Mermaids in the Basement by our very own Michael Lee West, our fabulous hostess for Foodie Friday! I read about half the book last weekend and so far, I'm lovin' it! Perfect for a wonderful outdoor day. I'm saving the rest of the book for this weekend, when I'll be picnicking at the Crooked River State Park, just four miles from home. 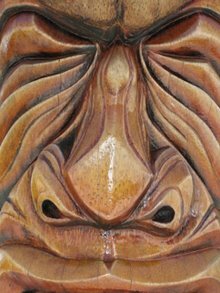 You can find this book at your favorite bookseller, online or, of course, in my Tiki Hut Store. Have a fab Foodie Friday and stop in at Designs By Gollum to see who else is participating this week and enter Michael's latest giveaway with a chance to win a Le Creuset Skillet! Exactly 11 days to go and then I'll be watching a Gulf sunset! What a super post.. all the makings for a beachy picnic..
the only thing missing was a friend to share.. but again, you wanted to finish your book undisturbed!! Whoa! You DO think ahead!!! I could learn from you...loved the slaw recipe and am going to put it together today! Happy Foodie Friday and have a great beachy weekend. You sure know how to have a picnic!!! Wow! And I am adding that book to my summer non-textbook reading list!! Yipppee!! Thanks for the recipes and the tip on the Bento boxes! You really have all the makings for a wonderful day. I am definitely going to try the salads. I am always looking for new things to serve at the lake and the Bento boxes sound perfect for the boat. Adding potatoes to the slaw was a stroke of culinary genius. 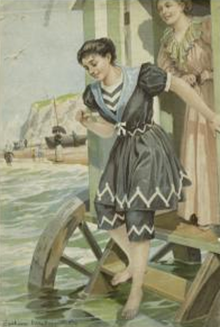 And the beach is the perfect backdrop for a picnic. I'm thrilled that my mermaids got to come along. I hope they behaved! LOL The photos are AWESOME. What a delicious looking picnic! Your recipes sound great. Great pics! The salads sound yummy, especially the potato using dressings. I hate mayo. I will try that vegetable salad too, its my speed as a marinated salad! YUM!. I too like a lil kick. Wish I couldve come along too. Looks like a great day! ok, dont tell me how the book ends. super cool bento idea. 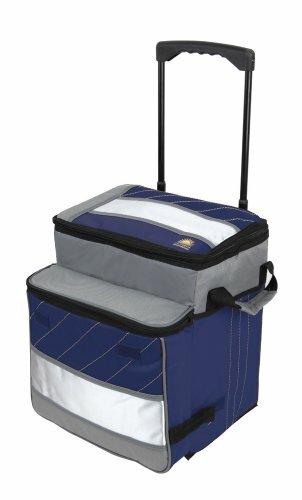 i have a similar cooler on wheels... use it all the time! Sounds fun, looks really yummy and Congrats, YOU WON MY GIVE-AWAY! E-mail your full name and address so I can forward it on to CSN. Hi hut! 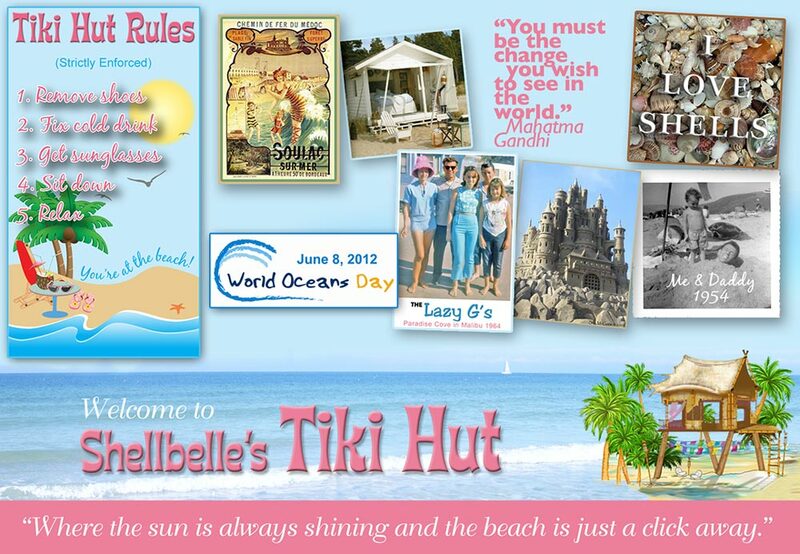 I stopped by to thank you for your kind words at my blog today. Now, I want to come for a picnic! Your pictures look yummy. You are so organized .. i bet your new home is all unpacked and comfy already.. and boy did I laugh about the Sleeping With The Enemy scene.. hahahaha.. the handtowels.. and the food cans!! Oliver and I want to come along on a picnic with you so bad...one day we will !!!! All you picnic fixings and salads look so yummy. and Michael's book is just the perfect picnic read. Thanks for the tip on the boxes, Rhonda. I did not know that these were the best, but I appreciate you letting us know. And I love Michael's books, too. She's a super writer. I have yet to read MERMAIDS, but that's on the agenda this summer. I had a fall on Thursday that laid me up, even though I fought being hurt. I even went shopping for my sister's birthday present after I fell which was not the smartest thing, but I didn't want her to kill me for forgetting her birthday! ;-) Fell on concrete and brick. 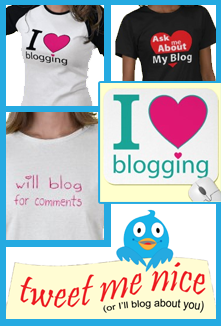 I'm just now blogging again today, though I did try and read some. I do want to get together and meet you for a day of shopping or even window shopping and some lunch. Michael Lee has several books out there. 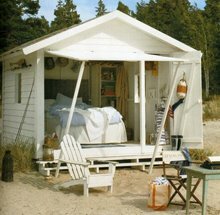 I foresee many trips to the beach with your bento box lunches and some good reading. Good to know that about the containers. I prefer glass for my lunches but the plastic lids are always leaking. I saw Michael's comment on Facebook and had to come see for myself! What a great idea! Love the bento boxes, and the food looks so delicious. I have this book too from Michael. Also, I love cabanas too. I have one in my backyard and recently did a post on it! I love your bento box idea and the rolling coler. You are all set for many wonderfulbach picnics. Wonderful recipe ..everyhting looks so good and healthy!